1. Sophisticated Elegance ReturnsIt’s back to basics with elegant, sophisticated style in 2011. 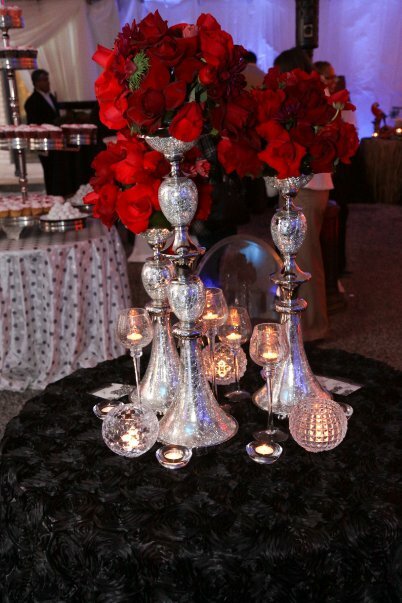 Wedding decor will be simple and understated, with modern design elements trumping DIY touches. Scripted calligraphy, custom monograms, and classic wedding cakes embody this trend. Brides will wear pearls, and grooms will ditch the Converse in favor of more tasteful wedding day kicks. 2. 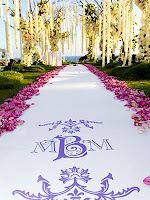 Outdoor Venues- Where It’s AtCouples tying the knot in 2011 will gravitate toward outdoor ceremony and reception venues. The raw, minimal backdrop of an outdoor setting leaves room for personalization and customization, a major perk for creative, hands-on nearlyweds. Lakeside venues, vineyard locations and spaces situated alongside sprawling mountains will dominate, and they’ll be spruced up with personalized touches that represent the bride and groom. You’ll find some serious outdoor weddings inspiration in our real weddings blog category! Gloomy no more, grey is the neutral IT color for 2011 weddings. Organic and natural, shades of charcoal, dove, stone, oyster and shell will be incorporated liberally into wedding color palettes and paired with vibrant hues to make the colors pop! And while grey remains the talk of the town for 2011, navy blue (and other deep blues) are definitely on-trend for the coming year. Wonder if Prince Will’s royal wedding has anything to do with the crazy for navy trend… what do you think?? 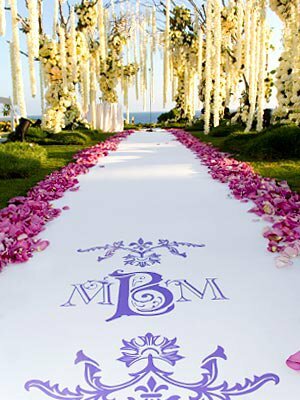 Whether it’s two bright hues with a metallic accent, or several metallic shades used together, brights and metallics will be popular choices for wedding color palettes in 2011. Gilded gold, shimmery silver, and sparkling champagne will used alone or with accents of yellow, purple or teal. And since metallics make such a bold statement on their own, couples will scale back over-the-top decor in favor of a more restrained style aesthetic. Dramatic ball gown wedding dresses floated down 2011 bridal catwalks in droves. Wedding dress designers draped, ruched, and layered clouds of tulle, power netting, and chiffon to fashion wedding dresses with limitless volume. The outcome? Fairytale-inspired bridal style and whimsical wedding dresses for 2011 I Dos. Grooms are taking a stand in the name of fashion. Their tux choices will no longer be dictated by some “rent 5, get 1 free” deal. Instead, they’ll chose formal looks that represent their unique style. Bow ties will replace classic long neck ties, and embroidered dress shirts, engraved cufflinks, stylish lapel pins and the color of the season- grey- will grace the white aisles. The green weddings movement continues full speed ahead in 2011. From totally paperless wedding invitations and save-the-dates, to stationery printed on 100% recycled paper, invitations have truly gone green. Couples can find all they need with sites like WeddingPreParty (enabling online RSVP and party planning) and Nearlyweds.com (offering coordinating stationery and wedding websites). Luxe textured fabrics will bring a sumptuous, opulent vibe to 2011 weddings. Wedding dresses will feature 3D applique, layered light fabrics (tulle, lace, chiffon), romantic ruffles, oversized florals, and illusion fabric with eye-catching beading. Textured linens will be layered to dress up reception tables, chair covers may be embroidered or beaded, and branchy centerpieces and floral arrangements will captivate wedding guests. At long last, brides and grooms are embracing and showcasing their unique cultural traditions and ethnicity. Whether it’s a religious wedding ceremony ritual, traditional wedding day garb, cultural cuisine infused throughout the reception dinner, or wedding decor with bold, ethnic prints, you can’t help but embrace the unique cultures and ethnicities of couples in 2011.
Who wants the best day of their lives to end? Not couples and guests in 2011, that’s for sure! Couples will plan a post-reception after party lasting into the wee hours of the night with drinks, entertainment, dancing, and snacks so that wedding guests can party all night long!